Last Sunday morning, my longtime friend and co-astronomy enthusiast, Muir Evenden and I went observing again together for the first time since 2006. Growing up together on Cape Cod in the late 1970's and 1980's, Muir and I continued to foster each other’s interest in the field of astronomy Back then Muir would bring along his Celestron 8 telescope and I would cart my Edmund Astroscan 2001 4.25" Wide-Field telescope. 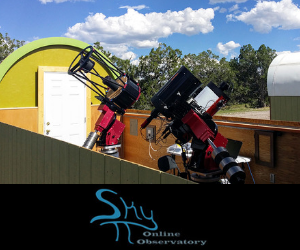 We would observe with these instruments through those years, bringing them to numerous observing programs for astronomy education and public outreach. After Muir relocated to the Phoenix, Arizona area back in the early 1990's, I would make a point to travel out there at least once a year. On those annual visits, we would travel down to the Tucson part of the state, rent telescopes for the week and observe at the base of Mt. Hopkins, site of the Fred Lawrence Whipple Observatory. Muir and I continued this tradition until the fall of 2006 as he then relocated to Poland shortly thereafter. Of course, Muir and I have always kept in touch through the years via Skype and eventually founded Insight Observatory together. However, because of the technologies that are available to amateur astronomers as well as students studying astronomy, Muir and I were actually able to observe the night sky while I was in my home office on Cape Cod and Muir at his residence in Poland. Via Skype, I shared my computer's desktop with Muir and we logged into the remote robotic telescope network located in New South Wales, Australia, operated by itelescope.net. 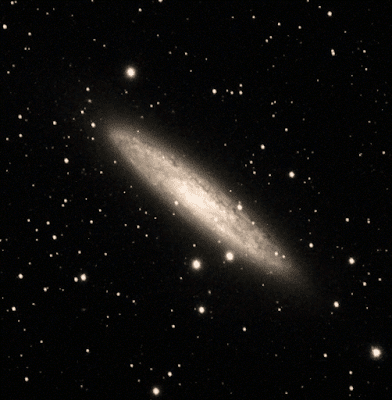 As we chose their telescope T13, a Takahashi SKY90, 3" f/4.6 telescope with a One-Shot color CCD camera, we looked at the list of recommended images to shoot and we chose NGC253, a spiral galaxy in the constellation Sculptor. We took a series of 5, 10-minute exposures of the galaxy. After each one was taken, we could go to the feature itelescope.net provides called a "Last Image Preview" and glimpse at the results. 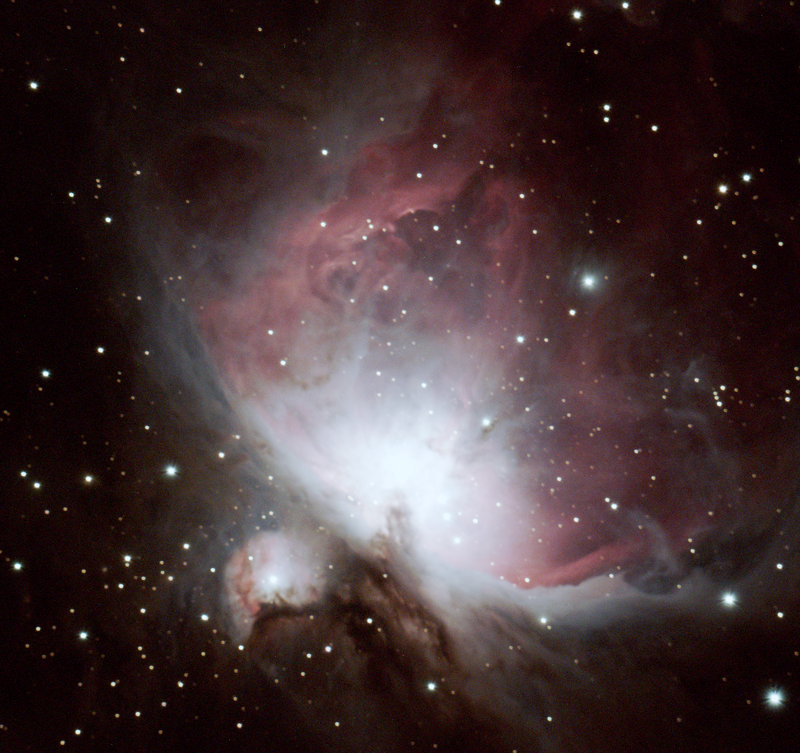 Muir then stacked and processed the 5 images in the imaging processing software called PixInsight. NGC 253 is one of the brightest galaxies in the sky, the Sculptor Galaxy can be seen through binoculars and is near the star Beta Ceti. It is considered one of the most easily viewed galaxies in the sky after Messier 31, the Andromeda Galaxy. The Sculptor Galaxy is a good target for observation with a telescope with a 12" diameter or larger. In such telescopes, it appears as a galaxy with a long, oval bulge and a mottled disc. Although the bulge appears only slightly brighter than the rest of the galaxy, it is fairly extended compared to the disk. In 16" telescopes and larger, a dark dust lane northwest of the nucleus is visible, and over a dozen faint stars can be seen superimposed on the bulge. After imaging NGC253, we skimmed through the planetarium software, Stellarium, and saw there was interesting quartet of large spiral galaxies, in the constellation Grus. This quartet of galaxies is known as "The Grus Quartet". The spiral galaxies are physically very close together and strongly interacting. The high starburst activity of two of the members, NGC 7552 and NGC 7582, is also thought to arise from tidal galaxy-galaxy interactions and subsequent formation of a bar in the disk. 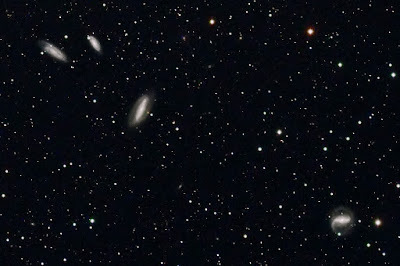 Several tidal tails are visible extending from NGC 7582, one pointing toward the neighbors in the east and the other toward NGC 7552, which lies at a projected distance of approx. 30' to the northwest. Muir and I then decided to take one 10-minute exposure of the group with T13. We were amazed to see how each galaxy in the image frame had a unique characteristic. After spending those couple of hours remote observing and logging out of the remote telescope network, I said to Muir "I actually feel like I did in the old days after good observing session."